All musicians with any band instrument experience are welcome to play with the Grafton Cornet Band. Our spring rehearsals on alternate Sundays (mostly) start in March. Check this website in Februrary for the full schedule. 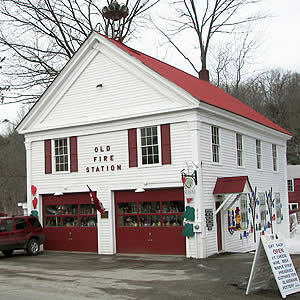 We meet upstairs at the Old Fire Station on Main Street in Grafton, Vermont from 2:00 to 4:00 with a refreshment break for some socializing. We have most instruments available to borrow for rehearsal time--including a slide trumpet and a double-belled euphonium! No dues or minimum commitment required, just an interest in making music and continuing a proud tradition. Of course, all ages of players are welcome. High school players are especially welcome to sight-read with us--whether in rehearsal, parade, or concert. We understand that your time is constrained, but we also know that experience with different groups is helpful. 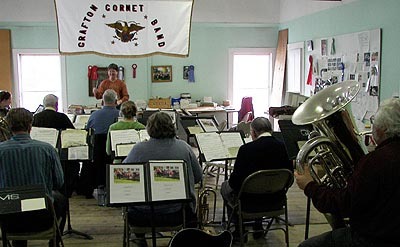 Most of us put our instruments in a closet after we finished school, but found out that the Grafton Cornet Band is the best way to blow the dust out of the old horn and get the chops back in shape. The Grafton Cornet Band grudgingly salutes the St. Johnsbury Band, 3rd oldest continuous band in the country. They're the reason we're not the oldest continuous band in the state. However, we've had our current name the longest--and the oldest continuous community band website in Vermont (1995).